It’s a Monet painting IRL. This isn’t a Monet painting—it’s a photograph. 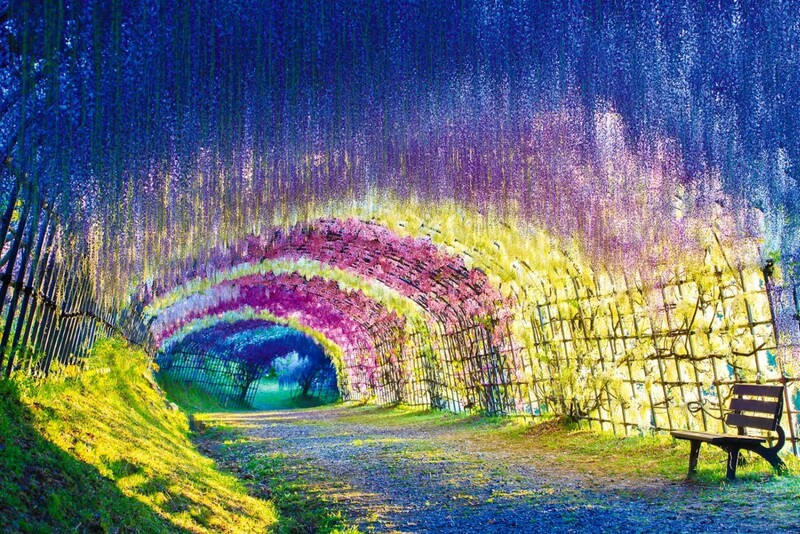 It shows a flower tunnel at The Kawachi Fuji Gardens, a private garden on rural Kyushu Island in southern Japan. The garden is open to the public for only a few months a year. The garden includes 20 different species of wisteria plants, but the wisteria tunnel is the garden’s prime spot. The pastel passageway looks like something straight out of a fairytale when the flowers are in bloom—all you need are roaming unicorns to complete the picture. In the Buddhist religion, wisteria is a symbol of prayer. The Chinese flower is a member of the pea family and is known for its climbing vines and winding branches. The plants can climb as high as 65 feet above ground and can spread 32 feet laterally, according to University of Florida’s Center for Aquatic and Invasive Plants. The flowers bloom in lavender, violet, pink and white. Visit in late April or early May to experience the full magic of the tunnel. Try to go during the “Fuji Matsuri” (“Wisteria Festival”) when the tunnel is in full bloom.